This has come up again and again and I’ve finally decided to sit down and address it once and for all in it’s own blog post. The topic at hand? Why I, Fussypants, do not use (many) addons in World of Warcraft. First things first, what do I mean when I say that I don’t use many addons? Depending on who you talk to, that could range from a hundred addons to zero. In my case, I have a grand total of five addons installed. Skada, DBM, oRA3, Iskar Assist, and XRP. Of those five, I currently have just one of them enabled, which is Skada. All of the rest I have used at some point in Warlords of Draenor but as they became less useful to me, I slowly began to disable them. Right now, DBM, oRA3, Iskar Assist, and XRP exist in the disabled void. So when I say I don’t use many addons, I really mean it. Alright I think we’ve pretty clearly illustrated my lack of addon usage so here’s going to come the ringer. A lot of times when I tell folks how few addons I use, they assume I don’t have many because I must harbor some deep seated loathing of any and all addon. I won’t download Master Plan or Vudho or Altoholic because I despise them with all of my soul. And that’s simply not true. 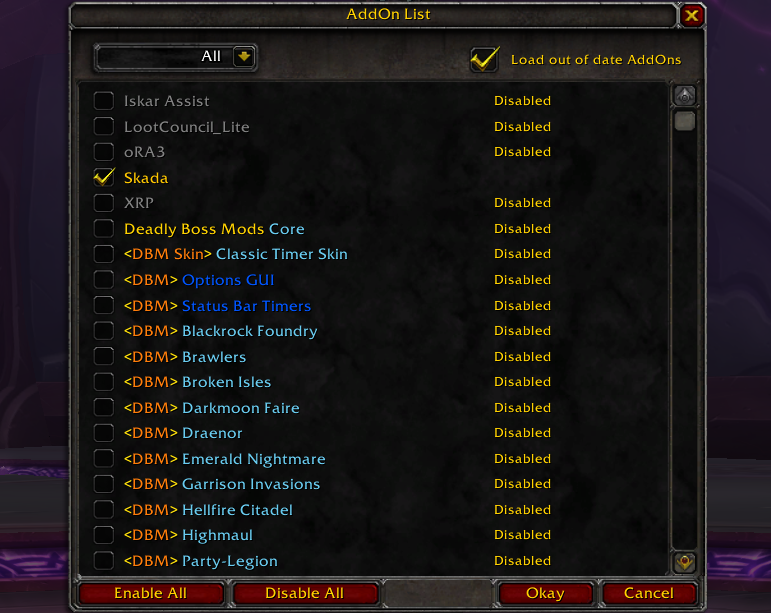 I do not hate addons. I just don’t find them very useful in my particular situation. Again, I’m going to pause right here and reiterate, all of this applies only to me. These are my feelings and thoughts about my gameplay and I, in no way, assume they apply to anyone else. If they do, great, we have something in common! But let it be known, I am writing this completely and solely about myself (what a narcissist!). I only use an addon if it does something that I absolutely need in order to play. I have Skada so I can gauge my performance and see if I am where I need to be. I had oRA3 to keep track of several pieces of information that I needed for raid leading, chief among them battle resurrection timers and flask and food buff checks. I had Iskar Assist for the Iskar encounter in Hellfire Citadel (but in reality, I rarely thought to use the addon and instead clicked the new action button almost every time). I had XRP to facilitate roleplaying, the one time a friend and I rolled characters on an RP server. And I had DBM to inform me ahead of time when certain encounter abilities and phases were incoming. Each of my addons fills a specific roles that I need and otherwise would not have. If I find I need to be able to do something and the default in game UI is not clear enough or I can’t keep track of it on my own, that’s when I start looking into an addon to fill that gap. That’s how I ended up getting Skada; I needed a way to quantitatively test my specs and see how I was performing. When I encounter something in game and I can’t play happily the way it is, I start searching Curse for a tool to do the job. This also means that once I no longer need the addon, I’ll get rid of it. With Hellfire Citadel soon becoming obsolete, I will be uninstalling the Iskar Assist addon. I am not currently raid leading so I will probably dump oRA3. And I know all of the boss fights in HFC well enough that, for the time being, I’ve disabled that too. Addons are only useful if they are doing things I can’t do by myself. I am well aware that with certain addons, I could most likely be just a tiny faster, better, more successful, whatever you have it. But that has never been my goal in game. I don’t play to be the best, I play to have fun. Sure, a lot of times being good at what I do is fun enough on it’s own but I’ve never felt the urge to eke out that very last percentage of uberness. Call me lazy, call me casual, both are probably correct and neither really bother me. So why fix something that isn’t broken? Why would I install an addon to be just a little bit more productive if I’m already perfectly content where I am? Let’s use an example. My most favorite thing to do in game is fill the healing role in raids. I have one of every single healer and I spend 85% of my times in raids healing. However, I do not, and will not get the addon Vudho (or any of the alternatives). People have asked me, and even told me to get a healing addon but at the current, I don’t see any reason to. As it is, I heal just fine. I might not be the best, I might not be the worst (at least I hope not!) but I genuinely enjoy the act of healing. Of clicking in the raid frames and then hitting or clicking a button to heal. To me, it’s fun! It’s how I relax. It’s how I challenge myself. It’s how I game. If I someday got to the point where I couldn’t respond fast enough, perhaps then I would download a healing addon to help with that. I won’t rule out that possibility. But right now, I seem to be doing pretty good. I don’t really need it and so I don’t plan to download it. This is not to say I begrudge the folks who have hundreds of addons. Play the game how you’d like, I’m not going to judge you! If you use Vudho or Healbot or Grid or Clique to heal, power to you! If you’ve modded your UI into a completely different form, go for it! If you have a tracker and timer for every spell effect, go hog wild! But also, to those folks who play with the basic UI, have a blast! To those folks who use the basic raid frames and in game timer, you do you! The way you play is not in any way worse. 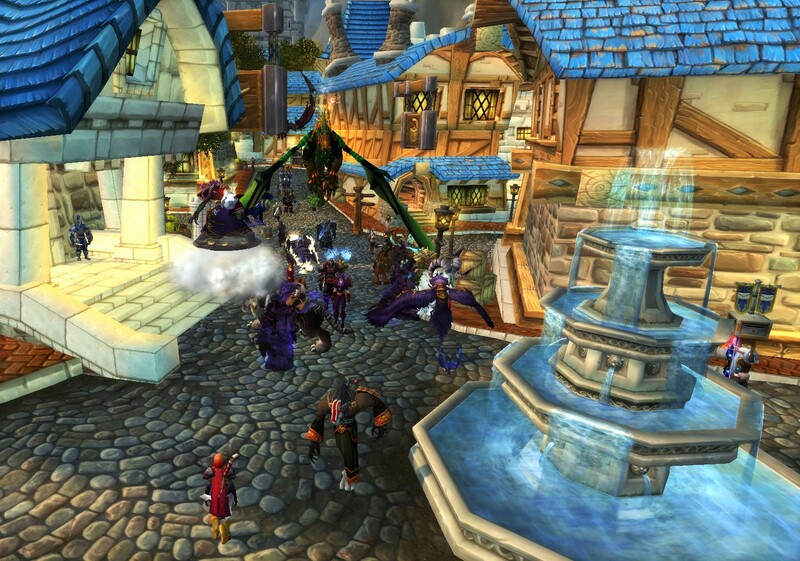 As much as we’d like to joke about it, there’s really no wrong way to play World of Warcraft. Make your own fun your own way. Transmog and class changes and bag space, oh my! First there was stillness. A veritable pause, as if the very air was waiting, frozen solid in anticipation. And then, the call was sounded. The servers are coming back up! The patch is here, the patch is here! And with that, the frozen clarity of the moment shattered. The people logged in and basked in their new transmog and bag spaces and class changes. 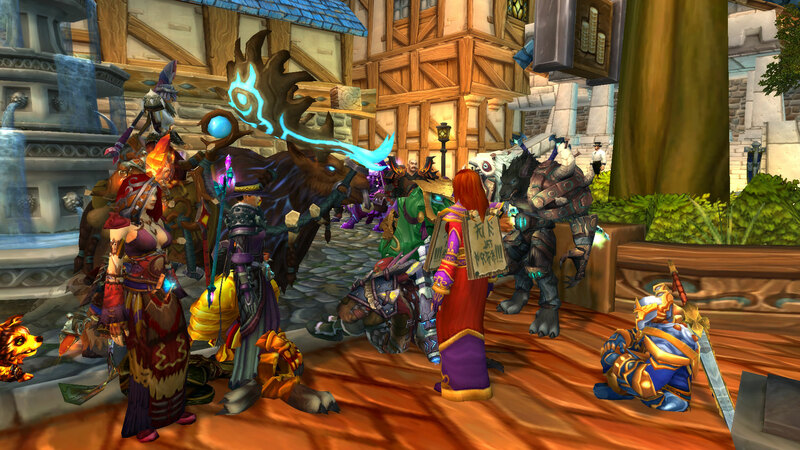 The streets of Stormwind were flooded (for it appeared CRZ had been turned on there) and the taverns filled with chatter. A new era began. A prepatch so momentous deserved and introduction like that, don’t you agree? This Tuesday, a couple hours ahead of schedule, Patch 7.0.3 the Legion prepatch went live. Fussypants (and a few hours later, Yotaan) were right in the thick of it, digging into the new transmog and class changes. Here’s what they thought. Fussypants: Oh man oh man oh man, I’ve been waiting for this for months! Where do I even begin? Well ok, let’s go through the path I took when logging in. Like many, the very first thing I did was log into every single one of my characters and learn the armor and weapon appearances. I had two alt guilds full of gear just waiting for the wardrobe and so this task took me two days to fully complete. And even now, I still need to go back through with a fine toothed comb. However at this point, I’d build up enough appearances in my wardrobe to begin the second part of my prepatch adventure. My Shadow, Holy, and Discipline sets, respectively. SO MUCH PRETTY CLOTH! I honestly don’t know how I survived without the wardrobe, it is truly fantastic! Hundreds of pieces I had no idea I had, thousands of possible combinations; it was transmog heaven! And the ability to set transmog sets per spec, man oh man is that amazing. If I had to make one complaint, I would say that I wish I could view other types of armor than the one my character uses while viewing through the Collections window. But in the grand scheme of things, that’s small potatoes. The Wardrobe is still a beautiful, beautiful thing. After going through and nailing down transmogs, my next step was to set up all of the specs on all of my toons. That task took the better part of two days as well (when I mean all specs, I mean all specs). I have not gotten to test anything super extensively but I did get to run a good number of timewalker dungeons while trying to get the hang of the new Holy Paladin (verdict still incoming on that spec). I have to say, it was super exciting to set up the “new” spec on each toon that I previously had never played. I can dps now! Of all the specs that I looked at, the one that caught my eye the most was, of all things, Shadow Priests. Partly in an attempt to test drive and partly to farm up some Marks of Honor for transmog, I did a number of battlegrounds with my priest. Now I’m not the most PvP oriented person (raiding is really my bread and butter) but I actually had a ton of fun Mind Blasting the Horde. Putting everyone on equal footing stat and gear-wise meant that for the first time, I had a fighting chance. I wasn’t being roflstomped by people geared out to the nines; I had a chance to fight back. It was wonderful! 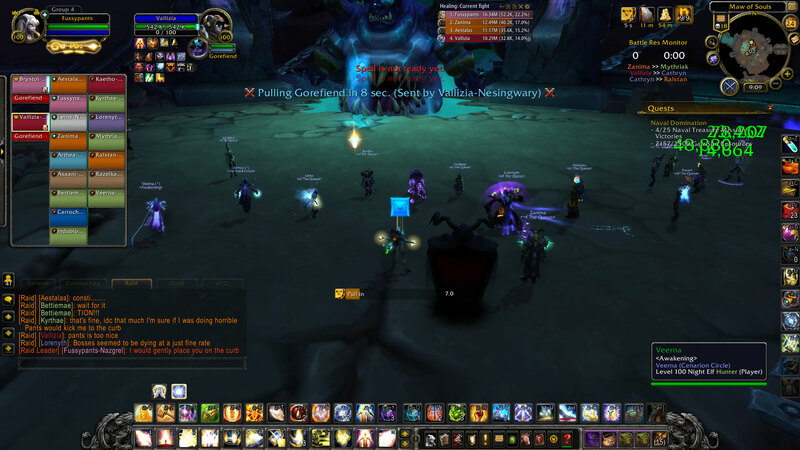 As for Shadow Priests as a spec, I found myself really really loving the new Insanity mechanic. Shadow Orbs were ok but I always thought they were a little simple. But this new resource, man is it fun! I love the interplay of building it up and then trying to maintain void form for as long as possible. And void form itself, what an awesome spell effect that is! 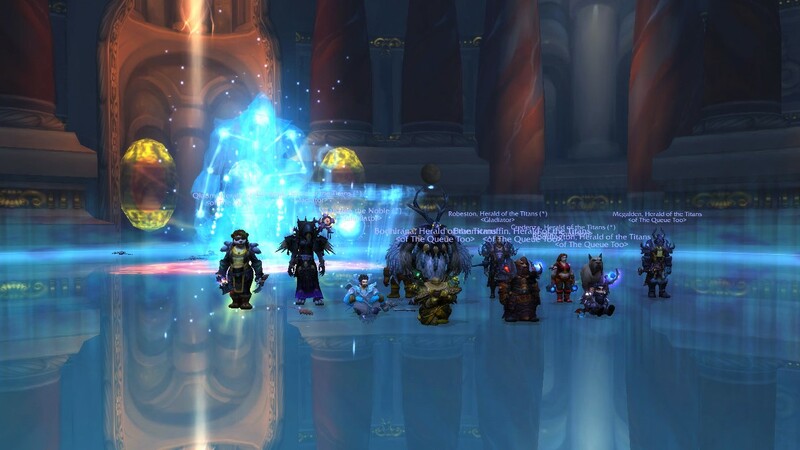 Shadow Priests felt loose, fast, frantic, and fun. I’m not so sure how this will look in a raid environment but for PvP and soloing, I was having a blast! And how could I forget the best part? Surrender to Madness, best talent 2016. Look at how many followers these guys have gathered! The last part of the patch that I want to touch on is the very beginning of the invasion event: the Doomsayers in Stormwind and Orgrimmar. Talking to them yields you one of twelve pamphlets on topics ranging from Buy Demon Insurance to Burn all Worldly Possessions. It’s a relatively small detail but it’s starting to build towards the actual invasion in a gradual yet still noticeable way. Also, there’s a Feat of Strength attached that basically involved killing your character repeatedly. Ok maybe not exactly that. But killing your character does speed up the process. Overall, this patch is looking like it’s going to go down as one of my favorite prepatches of all time. I was pretty underwhelmed with the Warlords prepatch but this time round, I’ve got nothing but praise. Still, I’m reserving final judgement until those demons start popping out. Yotaan: Content, FINALLY!!! It has been months and months of no updates, no patches. While one can argue that there is plenty to do in the World of Warcraft game, we all know that new content is the most exciting. So what I am excited about? Unlike Fussypants, transmog is not a big thing for Yotaan. He is happy to look like a mismatched clown. Well, that may not be entirely correct as I do turn off the helm and sometimes the cape. I did mog my helm to the fel sunglasses too. 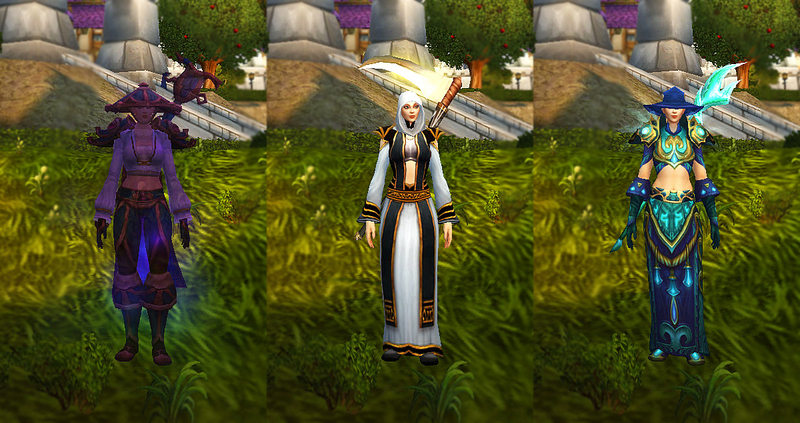 Okay, I transmog a little bit, like dipping my toes in the pool. I never fully jumped in. I did check it out and I am impressed with the options and the UI. What amazed me a little bit more is how few pieces of mail I have collected! Yotaan (formerly Yotin) has been my main for many years and I assumed that I collected a lot of quest gear and such. Boy, was I wrong! There are pages and pages of stuff to get. The little OCD dude in me starts twitching when I look at the uncollected. Additionally,I don’t think we have another active toon playing that wears mail, so any new mail armor is just for me. Hmm, now that is something to do, collect mail! For me the other big content change is the complete and utter change to my elemental spec. We are greeted when we log in to our elemental toons practically empty action bars. I mean no buttons to click, no keys to mash. It was a bit of shock actually. So I went through my spell book to repopulate my bars. The basics are there, my shocks, lightning bolt, lava stuff. Um, so, where are my totems? So many are missing!!! Nooooo! Okay, it’s okay, Yotaan can survive this. I pull every single DPS spell I can and rearrange a few items. Wow, I have a lot of empty space still. I hope the talents can fill this out a bit. Heading over the talent window was a nice surprise really. There were lots of new and elemental specific choices. This was a welcome improvement. All my talent choices seemed meaningful and fun. There were even totem options, yay! If this is how the honor talents for PVP looks, then I am a happy panda indeed. Speaking of PVP, that was my next step. Fussypants was playing on her alternate toon, Fancypants who she specced shadow of all things. She was telling me the great time she was having. I figured battlegrounds would be a good place to practice new rotations and get a hang of Legion lightning and lava slinging. It was fun! I was getting owned by rogues and death knights, but my survivability is greatly improved since my previous foray into PVP in Warlords. Yotaan clearly needs more haste (and surprisingly to me, healing) but overall it still felt elemental and exciting. There may be a lot more PVP blogging in the future of Yotaan. Overall, things are looking good. I’m thinking that one of the two of us will prepay to get a Demon Hunter early (yay more content.) So looking forward to smacking those demons!